The town of McLeodganj is situated in Himachal Pradesh, India. The town dates back to the mid 19th century when it was established as a British garrison. Mcleodganj was initially the home of the semi-nomadic Gaddi tribe. Today, it serves as the residence of His Holiness, The 14th Dalai Lama - Tenzin Gyatso. However, even now, a considerable number of Gaddi families live in the villages around Mcleod Ganj. The Dalai Lama lives on the south edge of town. He came to Macleod Ganj in the year 1960 and since then, he has been living here only. Most of his house has been transformed into government offices, while he occupies only a small portion of the entire complex. 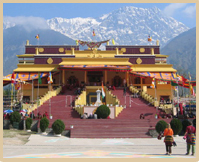 Tsuglagkhang, the main Buddhist temple of Dharamsala, is situated just opposite the private residence of The Dalai Lama. It houses the images of Shakyamuni, Padmasambhava and Avalokitesvara, all of them sitting in meditation postures. Gompa Dip Tse-Chok Ling is a small monastery situated at the foot of a sharp road. The main prayer hall of the monastery is adorned with the image of Shakyamuni. The other attractions of the monastery include its beautiful and intricate mandals. There is also a library of Tibetan works and archives in McLeodganj. It comprises of a rich collection of almost 40 % of the original Tibetan manuscripts. There is also a photographic archive in the library. Air : The nearest Airport is at Gaggla, approximately 13 km away from the town. Rail :The nearest railway station is that of Pathankot, approxiamtely 85 km away. By Road : There are regular bus services from Manali, Delhi and Shimla to Dharamsala. © 2012 Buddhisttour.com All Rights Reserved.